“Still, the decline in deaths is welcome and gives the city a strong start in its efforts to reverse the trend that left 344 dead in 2015. 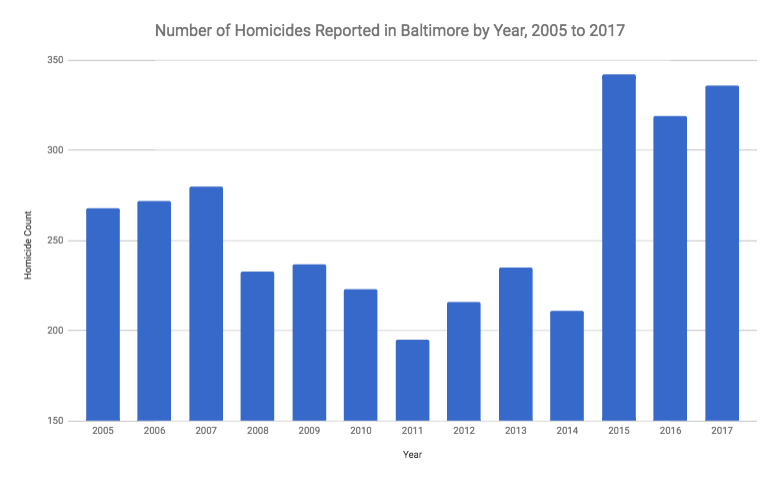 That was the second-highest homicide count in the city’s history — after 353 in 1993 — and per-capita the deadliest year on record; the city’s population is significantly smaller now than it was in 1993. Police Commissioner Kevin Davis has said he wants 2015 to be an “asterisk year” in Baltimore’s history — standing apart and not setting a new trajectory. “That’s momentum we hope to build on in 2016,” he said. After seeing 344 (later revised to 342) homicides in 2015, Baltimore experienced 318 homicides in 2016, a decline of 26 homicides (about 8%). That was still a very high number of homicides compared to years before 2015. And, as you know by now, 2017 broke the per capita record with 343 homicides. All in all, the current homicide epidemic started in 2015 and continues today. So here we are in January of 2018, with 11 homicides in the first half of the month. Multiply that times two and you get 22 homicides projected for January. Then multiply that by 12 and you get a projection of 262 homicides for the year. But, as we’ve told you before, this is not the way to do these counts. There isn’t a magic reset button at midnight on New Year’s Day. If 2016 saw 14 homicides in all of January and ended with 318, then you can see where we’re at a high rate right now with 11 in 15 days. So we’ll likely see more than 318 homicides this year, as hard as that is to accept. The best projection right now is what the yearly rate of homicides for the last 365 days has been, which is 0.93 homicides per day. That gives us a projection of 350 additional homicides for 2018 at the most and about 330 at the least, if nothing else changes. A geographical analysis (like this one) would aid police in knowing where to focus their efforts. Yes, the police and other authorities in Baltimore need to give people hope. They can’t throw up their arms and show any signs of feeling defeated during this wave of violence. But they also need to be realists when it comes to these hopes because projecting a rosy outcome with a very painful eventual reality just erodes the public’s confidence that, first, the authorities know what they’re dealing with, and, second, that the hopes they project are real.